My diary for this period 28 years ago makes a series of slightly concerned references to an ‘apparently quite serious’ nuclear accident in ‘a place called Chernobyl‘ – a previously unheralded town in the then Soviet republic of Ukraine. * With typical reluctance, the Soviet authorities only agreed that an accident had taken place after the radiation alarms went off at the Forsmark Nuclear Power Plant in Sweden – over 1,000 kilometres away. ‘Apparently quite serious’ turned out to be a significant understatement. Chernobyl remains the worst nuclear power plant accident in history (in terms of cost and lives lost) and is one of only two to reach the maximum classification on the International Nuclear Event Scale – along with the Fukushima Daiichi tsunami-related meltdown in 2011. Its effects continue to be felt to this day. A decade earlier, the accident at Three Mile Island had thrown doubt on the future of nuclear power, but Chernobyl cast an even longer shadow. It quickly became impossible to imagine a completely ‘safe’ nuclear plant, many countries began scaling back their nuclear ambitions, and 70’s-style ‘Nuclear power? 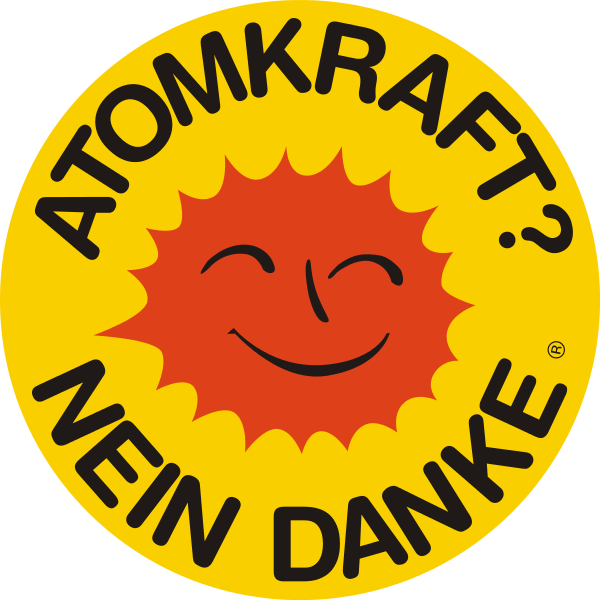 No thanks!‘ (or more frequently, ‘Atomkraft? Nein danke!’) stickers began to proliferate once again. Yet despite all this, the industry survived and eventually began to thrive. In many ways, the longer-term impact of Chernobyl was to promote the international nuclear cooperation which has resulted in today’s more robust global safety regime. Nuclear remains controversial for obvious reasons, but with the end of fossil fuel supplies in sight and global warming an increasing threat, many countries – the UK included – are returning to it as the possible answer both to longer-term energy independence and challenging climate change targets. Even some of the early environmentalists who were instinctively anti-nuclear – such as Whole Earth Catalogue author Stewart Brand – have begun suggesting we should revise our thinking. Brand now sees nuclear as the cleanest current form of reliable, grid-scale energy generation, and believes there are practical ways of dealing with related issues such as reprocessing, waste storage and weaponisation. Remembering how I felt watching events in Russia unfold, it’s hard to believe that the push for ‘green’ energy is yet to yield a resounding winner. And if the post-Chernobyl nuclear makeover continues, it may be some time yet before the incentives to develop clean renewables are quite as strong again. *These sorts of national boundary changes are nothing new to followthehumming – and current events in Ukraine suggest more may be on the way before too long. This entry was posted in History, On this day, Politics, Power, Technology and tagged Accidents, Chernobyl, Energy, Environmentalism, Nuclear power, Renewables, Stewart Brand, technology on May 18, 2014 by followthehumming.